How long is it before I receive my order? Why was my credit card not accepted during checkout? Do you carry a specific model/color/size? What do the letter sizes stand for? How should I care for golf shoes? What does a waterproof warranty mean? Who is GlobalGolf and what do they do? What is the difference between real leather and synthetic leather? Once an order is shipped, you will receive a confirmation email along with a tracking number. To track your GSO shipment, you can visit the following URL www.golfshoesonly.com/secure/orders/tracking.aspx, simply enter your order number and the email address that was used with your order. We are unable to provide tracking numbers for manufacturer drop shipments or APO/FPO shipments via the US Postal Service. Call our Customer Service Team for more information. If you are not 100% satisfied with your purchase, we will be happy to accept the return and offer a full refund or credit within 30 days of purchase. Click here for complete instructions. Expedited orders are not delivered on Saturdays. In addition, we can not accomodate requests for expedited service for orders that are paid with a check or moneyorder or PayPal. Expected delivery dates for non expedited orders vary depending upon method of shipment and shipment location. Occasionally shoe orders are shipped directly from the manufacturer, referred to as drop shipments. We place orders with manufacturers every business day and typically those orders ship within one-two business days. For tracking information for drop shipments, please contact us. At this time we accept only Visa, MasterCard, Discover, American Express, and PayPal. Yes. We ship to over 90 countries via Worldwide Express. International orders are subject to duties and taxes which are levied once a package reaches a specific destination. You may be subject to these and other charges which are your responsibility. These charges vary by country. You should contact your local customs office for further information. International customers may be required to provide proof of credit card ownership. For your protection, we verify the security card number (3 digit CVV) and address for all credit cards. Please double check the credit card number and expiration date. If you experience difficulties during checkout, please call your credit card issuer for assistance. Also, at this time, we only accept Visa, MasterCard, Discover and American Express. We carry a large selection of products. For all in-line shoes (those that are not closeout), we are able to ship all available sizes for those models listed on the site for FootJoy, ECCO, Callaway, Etonic and Adidas. We also add new styles and brands often, so make sure to check back with us frequently. For all closeouts, we can only ship for those models, colors and sizes that are shown on the site. If you have any questions, please call us. In compliance with various state sales tax laws, we collect sales tax for those states that require it based on either physical or economic nexus laws. Based on the ship-to address you specify in your order, we currently collect and remit sales taxes in North Carolina, Massachusetts and Utah (states in which we have physical nexus) and Alabama, California, Colorado, Connecticut, Hawaii, Illinois, Indiana, Kentucky, Maine, Maryland, Michigan, Minnesota, Mississippi, Nevada, New Jersey, North Dakota, Ohio, Oklahoma, Pennsylvania, Rhode Island, South Carolina, South Dakota, Tennessee, Vermont, Washington, Wisconsin, and Wyoming (states in which we have economic nexus). If we are shipping your order to any of these states, the appropriate sales taxes will be added to your order total in accordance with state and local sales tax laws and such taxes displayed in the shopping cart and on your final order confirmation. If you do not know your shoe size, we would encourage you to measure your size with a ruler or common Brannock device. As with all footwear, manufacturers use different lasts, so sizes may vary from manufacturer to manufacturer. A closeout is a discontinued style that is no longer produced. Closeout shoes are new and qualify for all warranty coverage offered by the manufacturer. Always clean your shoes after each round and store them at room temperature. Never leave your shoes in a car trunk or in a garage. Constant exposure to both heat and cold can cause leathers to become brittle and crack. Use cedar shoe trees which remove any excess moisture and help the shoes to retain their shape. Not walking on cart paths or asphalt will prolong the life of your golf shoe spikes. Replace your golf shoe spikes every 10-15 rounds. Some golf shoes include either a one year or two year waterproof warranty. The warranty is determined by the shoe construction. Shoes with a one year waterproof warranty have a treated leather upper while a two year waterproof shoe includes a waterproof membrane. If your shoes do not remain waterproof throughout the entire warranty period, please contact us as soon as possible. We honor all valid manufacturer warranties. 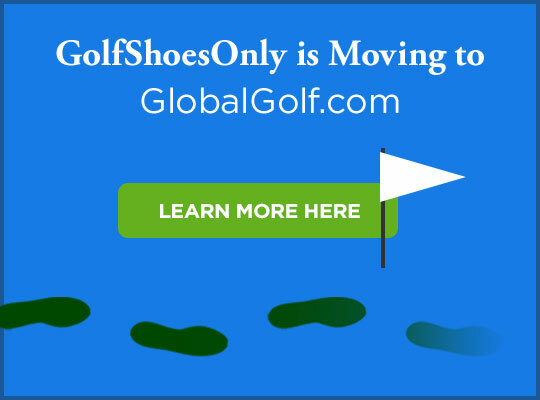 GlobalGolf is the sister company of GolfShoesOnly. Their site, GlobalGolf.com, features premium new and used equipment and accessories at outstanding prices. If you are looking for a premium club, bag, glove or golf balls, check out their site for fantastic savings. What is the difference between genuine leather and synthetic leather? A genuine leather shoe upper is waterproof and but requires more upkeep than a synthetic leather shoe. Genuine leater shoes often breathe better and are cooler on the feet. A synthetic leather upper requires less maintenance, and generally not waterproof and tend to be warmer than a leather shoe. Yes. It can be reviewed here.